Incessant rains prevalent in the country will continue islandwide through November, as the low pressure areas remain above the country, the Meteorology Dept. warns. 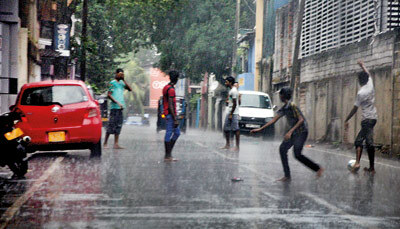 “The intensity of rain will increase significantly from today, over western Sri Lanka, and most probably, within the next two days several areas of the country will experience heavy showers and thundershowers (of more than 100 mm),” said Duty Meteorologist Dharshana Premathileka. He said mornings will still be warm resulting in the land getting heated and evaporation taking place. Towards evening, strong spiral winds, which could even uproot trees and damage roofs, will be experienced. He said dry zone areas such as Moneragala and Puttalam will receive the heaviest inter-monsoon showers. Temporary localised strong winds could occur during thundershowers. The public is requested to take adequate precautions to minimise damage caused by lightning. Met. Dept. Deputy Director, Anusha Warnasooriya said lightning associated with thundershowers was a foremost feature of the inter-monsoon season. “The difference between a cloud and the earth is about 100 million volts, and the energy of a lightning bolt is about 500 million joule,” she said. “Lightning is not always fatal. The extent of the damage depends on the path of the lightning through the body and the intensity of the current. It is important to take necessary precautions during lightning, as it is life threatening,” she added. Meanwhile, 18 spill gates of the Rajangana Reservoir were opened early this week, releasing 2,000 cubic feet of water per second into the Kala Oya. Hence, the water levels of the Kala Oya are on the rise, and the Dept of Irrigation requests residents on either side of the bank to be vigilant, said Anuradhapura District Irrigation Engineer, Prassana Thilakaratne. Anuradhapura District Government Agent D.P.G. Kumarasisri said houses in Amunugama, Galnewa, have been inundated, and three children were injured when an earth bank collapsed on their house in the Ambalangodella area in Warakapola. Head of Agro-Climatology, Department of Agriculture, Dr B.V.R. Punyawardena said precautionary measures need to be taken to improve drainage facilities in upland cultivations. He added that, the available rainwater should be channeled into reservoirs- which will help in the next Yala season.